Successfully defended my thesis yesterday, then went to three bars. No comic today! Oh hey, that guy! 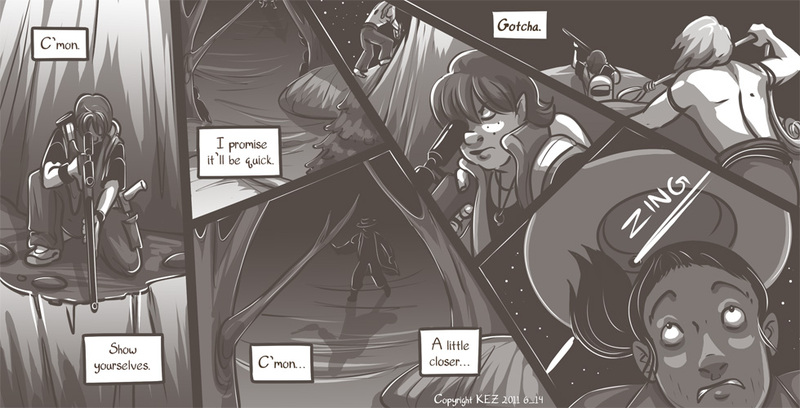 And by the way, Colbey did not shoot in the previous page. It was an ECHO. Well, the days here in Buffalo are numbered, and the numbers are running low. Four days to go until the move, and tomorrow I defend my thesis. Life is good! New adventures, ahoy. Captain Jack Sparrow reignites old flame and the little mermaid finds her priest while random Spanish attack; Ole! Oh yes, ships in bottles, ships equipped with flamethrowers, and those mermaids I mentioned previously have spidey-powers. Basically, random as hell, very amusing, not worth seeing twice. Was pretty happy Orlando Bloom AKA Legolas and Keira Knightly aka Pouty Mouth weren't there though. If you doubt me, go see it yourself. This week, the SpiderForest Comic of the Week is School Spirit! This comic is fun for all-ages, but don't let that make you think it's boring or nuthin' just because it lacks violence. I'm sure Dutch of sick of people describing his comic as Australian...but it's truuueeee. Young kids in school make friends with a local ghost, hilarity, puns and Aussie jargon ensue. School Spirit also recently celebrated its 1000th comic, a rare feat in webcomicdom. So check it out! In other news, The FML portion of Colbey's Sexify campaign updated! We'll go through a few evolutions, each one more ridiculous than the last. The first one is just anime school girl. And it really hurt me to draw it. $5 gets it flat colored, $15 more is shading and simple background.